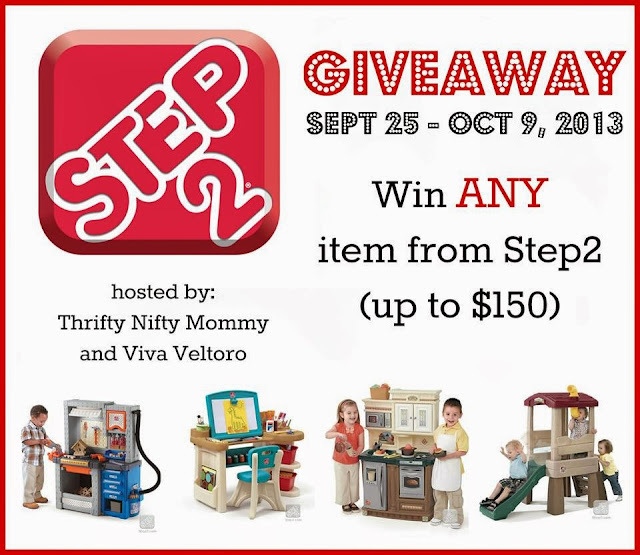 Welcome to the Step2 ANY toy (up to $150 value) giveaway here at Why We Love Green, hosted by Thrifty Nifty Mommy and Viva Veltoro! Those gorgeous life-play sets that you see are made by Step2! Step2 creates play kitchens, art stations, workbenches, and wagons. Each Fall, Step2 releases new items just in time for the holidays. If you are looking to get a Step2 toy station to encourage imagination and creative play for you kids for Christmas, this is a perfect opportunity to enter to win any Step2 toy! Read on to learn more about Step2 toys and to enter the giveaway using the Giveaway Tools form below. Good luck! 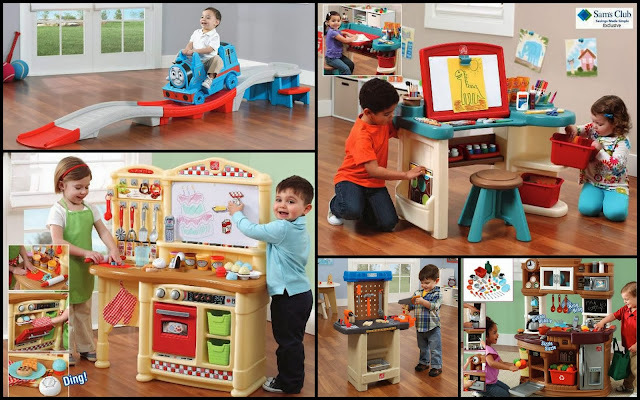 Thrifty Nifty Mommy recently had the chance to review one of their new play kitchens (pictured below in the bottom left corner): the Busy Bake Shop Kitchen. This kitchen is designed for use with play dough--what fun! Her daughter loves this kitchen, and you can read all about it here. These toys are so great because they encourage creativity, self-regulated play, and imaginative play. Kids love to learn by doing, and Step2 toys give them a safe and fun way to explore exciting activities! Visit the Step2 website to see all of the great products they have for sale. Also, you'll want to make sure that you sign up for their Birthday Club where you'll get great coupons before your child's birthday plus other special offers and deals, especially with the holidays coming up! Also, make sure you like them on Facebook and follow them on Twitter to stay up to date on their latest deals, coupons, and specials! The Step2 Any Toy giveaway is open to the residents of the 48 contiguous US states, ages 18+ ONLY. Ends 10/9/13. Disclosures: This promotion is in no way sponsored, endorsed or administered by, or associated with, Facebook. Thrifty Nifty Mommy and the participating bloggers, including Why We Love Green, are not responsible for prize fulfillment. Giveaway is open to residents of the 48 contiguous US states, age 18+. Giveaway will close at 11:59PM EST on 10/09/13. One (1) winner will be selected randomly from all eligible entries. Winner may select any toy from the Step2 website that has an original price (MSRP) of $150 or less; shipping will also be provided free of charge. If the winner would like an item that is more than $150 ARV, he/she will be responsible for the difference plus applicable tax and shipping. Please note, this is valid for ONE item up to $150 original price, not a suite of products. This post contains an affiliate link for Thrifty Nifty Mommy at the Step2 website. As a Step2 Ambassador, Thrifty Nifty Mommy will receive a small credit to spend at Step2.com for every new Birthday Club Subscriber.